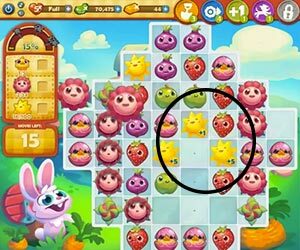 These Farm Heroes level 448 cheats and tips will help you beat level 448 of Farm Heroes. 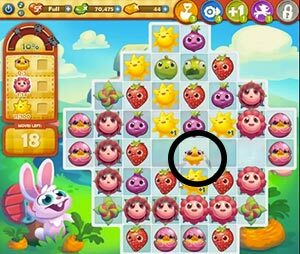 The objective of Farm Heroes level 448 is to collect five chicks, 14 flowers, and 100 suns in 24 moves. The first thing you should focus on in Farm Heroes Saga level 448 is collecting the 5 chicks that you need. All of the chicks are in their eggs and you will have to break them out to collect them. To do this, you will need to match 3 of them. When you get three of them in a row they will combine to create one hatched chick. While you’ll only start with a limited amount of eggs, have no fear. More eggs will drop down onto the screen as soon you’ve matched some. The next thing you have to collect on Farm Heroes Saga level 448 are bloomed flowers. 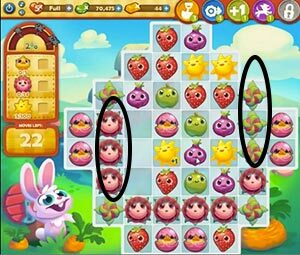 However, when you start the level, they still haven’t bloomed yet–as you can see from the circled cropsies on the right. To bloom the flowers, you’ll have to make big matches adjacent to the nascent cropsies. The flowers will bloom. After this it’s your job to try to collect them by matching them with 3 or more of a kind of another cropsie on the board. You can match them with whatever cropsie you want, but just remember to do it in the least amount of moves possible. You can use combinations from other cropsies to elevate the value of your suns before you collect them–thus making more points overall and getting a higher score. If you can manage to get two suns horizontal and parallel to each other as shown above, then you can try to get matches of 3 that form a T with those suns. Each time you do this it will add another value to the suns, making them that more valuable when you actually collect them. If you’re looking for more points, this is a great way to get ahead, while also completing your directives for the level.